Apple is serious about creating a foldable iPhone. Above, is a drawing for a patent Apple was granted last year. LG is reportedly in business with Apple to develop a foldable iPhone. A South Korean news site, citing unnamed industry sources, said LG has two separate teams working on key components for a flexible handset that could debut by 2020. The supposed partnership was reported Wednesday in The Investor blog of The Korea Herald. The report also said Apple sidestepped Samsung Electronics, which currently supplies the OLED screen for the iPhone X, to avoid its main competitor from stealing technology for its own smartphones. LG Display appointed a team to work on a flexible OLED screen. Its sister company, parts maker LG Innotex, also has a team to work on a design for an RFPCB, or rigid flexible printed circuit board, the unnamed sources said. Apple is considering investing in an LG plant to ramp up OLED production, the report said. 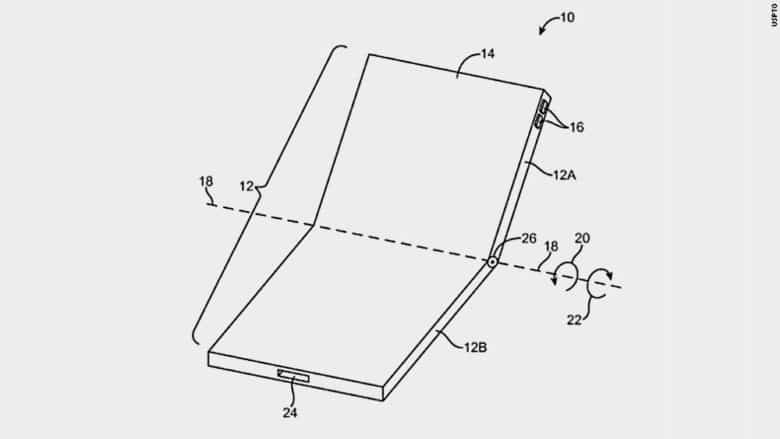 Apple was granted a U.S. patent for a foldable, flexible screen last year. Samsung is said to be coming out with a foldable phone sometime next year. LG has been working on a foldable OLED panel prototype for a couple of years and continues to tinker with it to improve durability, the report said.